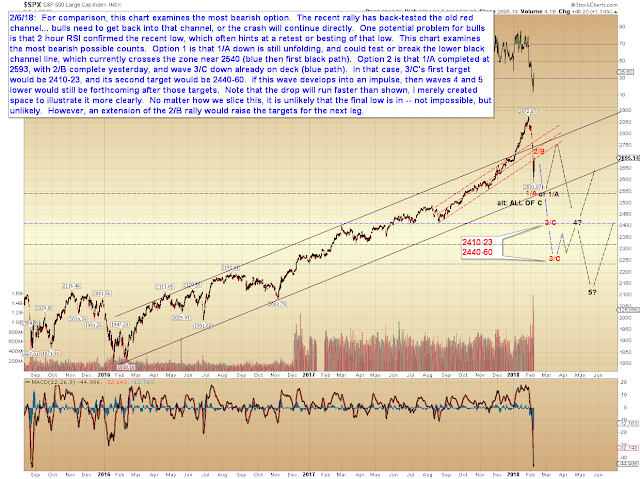 ...the market seems to have chosen the same route it chose on the way up, which was extended fifths. Extended fifths tend to offer extension upon extension with very little breaks in the opposite direction, as we saw during the rally of the past few months. The decline may choose to go that route, so don't get too attached to the potential B-wave I've sketched in on the chart below. It blows my mind how many people seem to have been taken completely off guard by this recent move -- probably because we've been pretty firmly expecting it to show up one way or another. We knew to expect this because the rally was part of an extended fifth wave, and as I've written dozens of times, extended fifth waves lead to rapid retraces in the other direction. This fact is exactly what prompted me to recently (on January 10) ask the question: "Does 2018 Rhyme with 1987?" 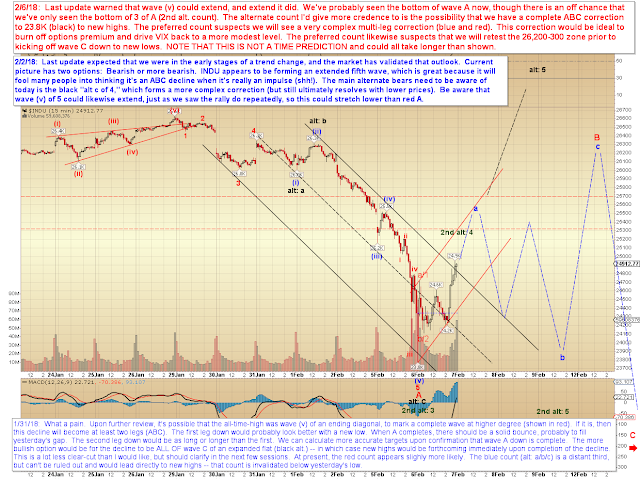 -- and conclude that we did indeed share the hallmarks for a "surprise" crash to show up in the not-too-distant future. There is also some present similarity to 1987 -- a year which saw a crash, but saw that crash come within the context of a larger bull market. Most interestingly, the blue chips have created the perfect setup for a very similar situation this year. And it might not be too far off, relatively speaking. As I've also written, I do not think this is going to completely end the bull market just yet -- but it could precipitate a much more significant correction (that much remains to be seen). 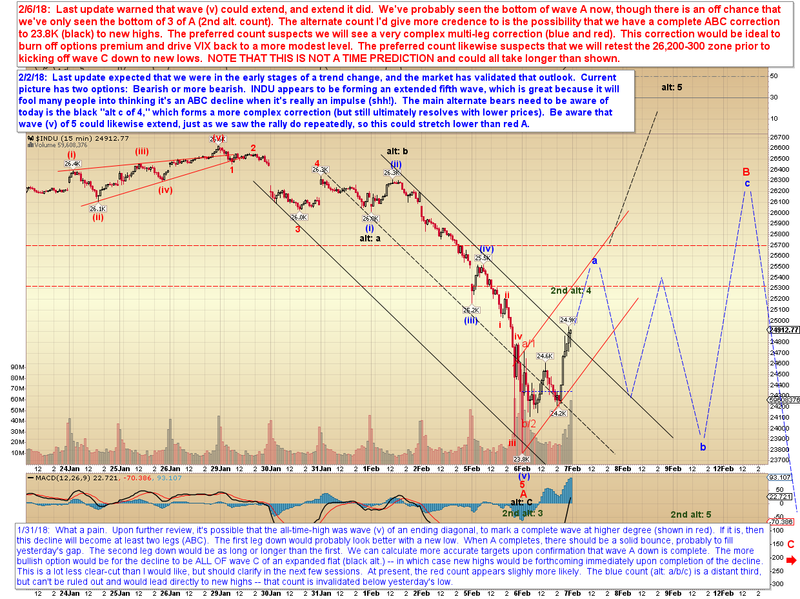 What does seem fairly likely, however, is that the final bottom isn't in yet. Add that to the first sentence, and we know that bottom could even, potentially, be a long way off. There are several forms the move can take from here. Let's look at the most complex option first, as that's what I'd prefer to see. The chart below is highly speculative by sheer necessity of the fact that there's really no other way for me to arrive at a chart this convoluted otherwise -- so we could deviate (substantially or otherwise) from the path shown. If we do continue to crash more directly, then "getting fancy" (as I did above) rarely works out. Obviously, if we sustain an immediate breakdown at the recent low, then we have to consider that the market may opt for the "more direct" route shown in the worst case chart above. In conclusion, the ideal move now would be for a super-complex correction that confuses pretty much everyone, bulls and bears alike, and grind around in a huge range eating up time premium at a time when volatility premiums are high. 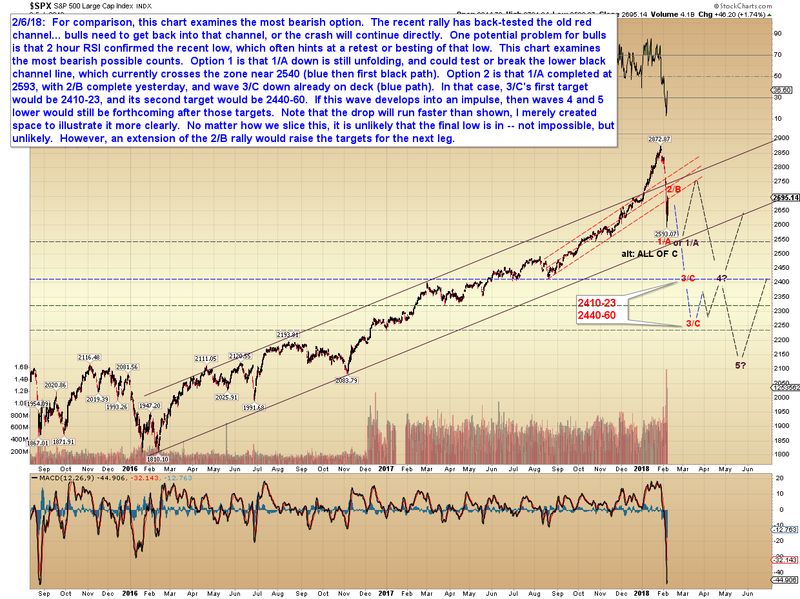 If we instead sustain an immediate breakdown at the recent low, then the potential exists for an ongoing waterfall. Trade safe.